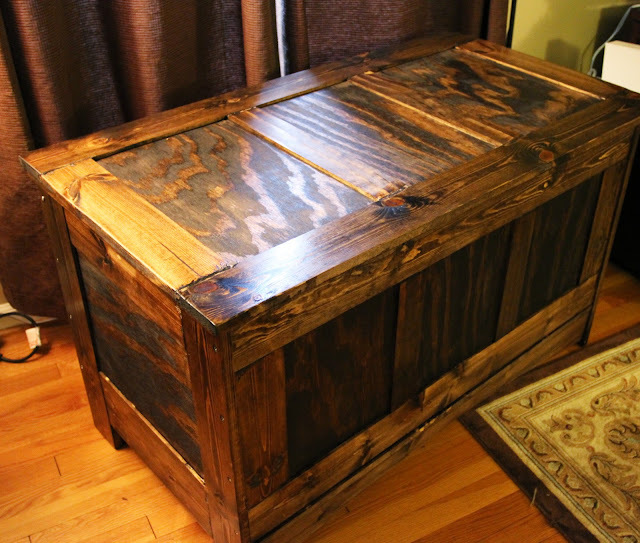 A few months ago, I got it in my head that I wanted to build a chest (toy box) for our living room. I'm not sure where this desire came from, but what the heck. I have absolutely zero experience in woodworking, but when I get something in my mind, there's no convincing me otherwise. I casually mentioned my idea to Ryan, who was very skeptical of my woodworking abilities, but supportive as always with a "Sure honey, whatever you want." 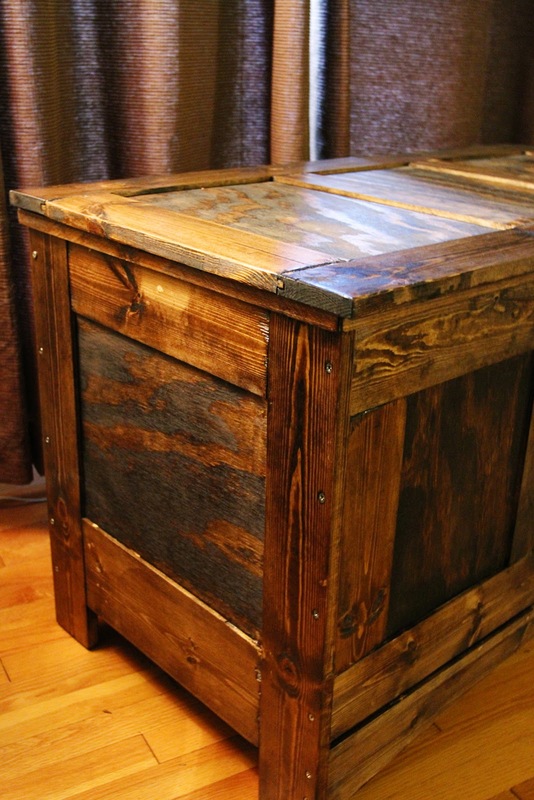 So, I began researching how to build a chest online and found some plans for a gorgeous Mission Style Blanket Chest that I absolutely loved. 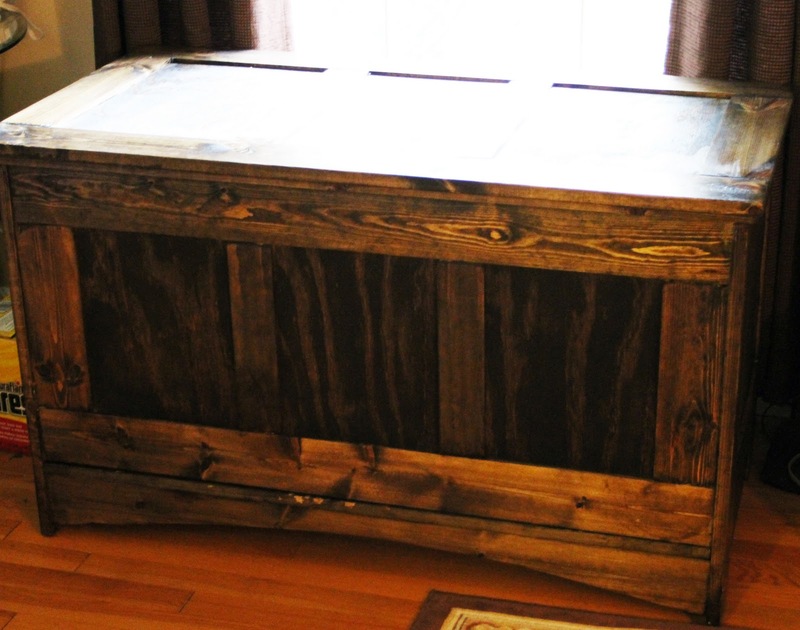 This chest was no plain-jane 6 pieces of wood thrown together, it was stylish and classic - man, I have good taste. :) The website said it was an "easy" piece, which probably meant easy for people who know what the heck they're doing, not so much for someone who just decided on a whim to build something from scratch with zero experience. I read through the directions about 3 times and I thought they looked pretty technical, but ultimately doable with a little guidance. I figured I could handle it (no lack of confidence on my part), so I downloaded them for $10 and decided to give it a go! Turns out, the plans were really great. The first page was a materials and hardware list and a diagram on how to cut the lumber to size. The next 8 pages were a step-by-step guide how to make the cuts/dados/chamfers/tenons, arrange the parts, assemble the pieces and get it all together. Of course, since I had absolutely no clue as to how this all worked or what everything meant, so I had to do a lot of Googling on the terminology (do you know what a dado is?). My first step was to get the lumber from Home Depot. Armed with my plans, I headed out on my lunch break and found someone to help me. I think this guy was even more skeptical than my husband that a little blonde in a pencil skirt and 4 inch heels was going to be able to pull this off, but he humored me and helped me out. Actually, he was great! Not only did he help me pick out all the wood, he was able to cut a lot of it to size for me, which saved me a ton of time. He also helped me pick out all the hardware I needed (nails, screws, hinges, etc.) and convinced me to invest in a table for my router (genius idea). He made all the cuts while I went back to work. I picked up the lumber on my way home that night and started unloading it. Unfortunately he couldn't make all the cuts I needed, so I still had some work to do. Most of the pieces were cut roughly to size, but I had to double check everything and make a few adjustments. Also, the employees are not allowed to "rip" any lumber (make length-wise cuts), so I still had a few boards that I needed ripped. Of course, I don't own a table saw (although now I want one), but one of my co-workers does, so I begged him for help! He was so great about it and offered to rip the final pieces for me that night and bring them to work the next day. (Thank you Dan!) Although, once again when he asked me if I knew what I was doing (and said not really) I got that "I'm not so sure you can do this" look. Grrr. Don't these men know that when a woman wants something, she will get it. I was really ready to prove them all wrong. So, it was finally time to get started! The first thing I had to do was use the router to make dados in the wood. These are basically grooves cut into the side of the wood, so other wood can fit in the space and the pieces will stay together. I don't think it would have been possible to make these dados without my new router table (below), which is my favorite tool of all time. I LOVE routing! This is what a finished dado looks like. 1/4 inch wide, with 1/4 inches of wood on each side, 3/4 of an inch deep. And this is what my routing table looked like at the end of the day. Man, there was a lot of saw dust. The first 30 something steps of the instructions were all routing, either making dados or tenons (the opposite of a dado) so all the pieces would fit together. Once I had finished each piece, I laid them all out in order and labeled them, so I could remember what was what before beginning assembly of the chest. This is the Type A control freak in me coming out in full force. I should really invest in Post-Its. Once everything was cut perfectly (which took about 4 days), I removed all the stickers and sanded all the pieces. Then it was time to start the assembling process. It was really amazing to see it all come together. This was the point where it all started making so much sense as to why I had the do all the previous steps. If a cut/dado/tenon that I made wasn't perfect, then we had a problem and I'd have to go back and fix it before it would fit together. I definitely messed up a couple pieces - but now I know and won't make that mistake again! I learned so much from this project. I started assembling the sides first. The boards with the dados cut into them surrounded one flat piece of plywood, which was inserted into the dado and created the legs and the side of the chest. Next I moved on to the front, back and lid of the chest and assembled all those sides. The front and the lid each had 3 pieces of plywood with boards in between them, to give it a panelled look. The back and the bottom of the chest were one solid piece. All the pieces fit together perfectly and were held together with wood glue. Below is the front of the chest - you can see a few gaps in the wood where my cuts were a little bit off while I was learning how to use the router and make the cuts. By the end of the process I was pretty good and the next time I do this, I won't have this problem. Below, the underside of the lid of the chest. I was finally to the point where I needed to assemble the sides, the back and the bottom of the chest all together. This process was a little much harder than I expected. Everything had to line up EXACTLY or it'd just fall apart. And I wasn't quite strong enough to manipulate the wood, while operating the drill. Needless to say, I started getting really frustrated that I couldn't do it by myself. I needed an extra pair of hands, but I didn't want anyone's help because I wanted to say that I'd done it myself and prove them all wrong. What's a girl to do? I'll tell you what I did - I cursed like a sailor and basically threw a giant temper tantrum in the garage until Ryan stepped in and helped. He held everything together while I hammered and glued and tried not to smash it into a hundred pieces. Believe me when I say that I am SO glad I married a patient and loving man - I seriously don't know how he puts up with me sometimes. We got it lined up and pieced together and it was starting to look like a real chest. Next I put the front of the chest on. I thought it was looking pretty darn good! The top/lid was the last piece to go on. Of course, I didn't want to leave it this light pine color. I wanted to stain it dark to match the rest of the wood in our house. So that was the next step. Two coats of stain later, it was looking really good. Then we added a coat of polyurethane over the stain. The stain really brought out the contrast and marbleing of the wood. And it even hid some of the flaws and imperfections that I was so worried about. The final step was adding the lid and bringing it inside. And that's it! I couldn't be happier with the results! It now takes up residence in our living room and holds our blankets and all the Wii Guitar Hero crap. So it's a combination toy/blanket chest. I'm pretty sure Ryan is proud of me as well - whenever he has a friend over he loves saying, "Hey, want to check out my wife's chest?" Hahahaha. Plus, he lets me take all the credit for the whole thing and doesn't even mention that he helped. Anyone else have any woodworking experience? You are insane. And amazing. That is GORGEOUS!!! I can't even put together bookshelves that come ready to assemble. I get frustrated after 5 minutes and stomp off to make a pitcher of margaritas and then watch as Z handles it. I love making stuff but my goodness...a chest! That is a helluva a project to take on. Well done! Looks amazing! Wow. Impressive. I'm sure that took great patience and skill. Great job! I am in awe of you. There is NOTHING you can't do! It looks great! And I just love you for taking on a project like this. Way to go! This is seriously incredible and turned out so gorgeous! Great job!!! I'm so jealous! How are you so crafty and awesome!? Have you seen the website http://ana-white.com/? This is where I got the plans for the bed I made. All of her posted plans are FREE!! I'm beginning work on a media console this weekend and I'm so excited! Wow, I'm impressed! Great job! seriously. we do not own a single tool, and I don't even think we could put together IKEA furniture between the two of us. You are so talented! I'm sure this will become a family heirloom. great job! Can't think of a man who wouldn't love a gal who knows how to handle wood ;) Good job darling. ha ha! "check out my wife's chest"! I am so impressed with your wood-working skills! That project looks like A LOT of planning but fulfilling effort! Love it! wow!! this is super impressive!!! Growing up my parents used to watch This Old House and New Yankee workshop all the time. It's like watching a cooking show. I love watching stuff like this come together. It's truely art... and such cool toys! Sara, I am so impressed! This is something to be truly proud of. I hope it becomes a family heirloom. are you kidding me??? I'm beyond impressed! like, i'm so inspired! also, i had no idea what a dado was. i totally want to take something like this on. WOW! I can't believe you made that! It looks awesome! I'm speechless. That is amazing. You should be really proud of yourself! Gorgeous piece of furniture!!! Wow, I'm in awe! Great job! I have a sister who is a commercial construction carpenter who I have been hounding for years to make furniture. Now I can show her your post so she can have some inspiration. Dear lord Sarah - I cannot believe you did that all (mostly) by yourself. I absolutely love it and am super jealous of your skilz! Puerto Vallarta - Adios Mexico!